Here at American Garage Door and Gate Systems, we believe in educating our clientele. A well-educated consumer helps keep businesses on their toes and more inclined to provide top notch services and work. This, of course, is win-win for everybody involved. Today we’d like to talk about a lesser known aspect of garage door maintenance – replacing garage door panel sections. Have you ever wondered about the possibility of replacing just one section of your garage door? 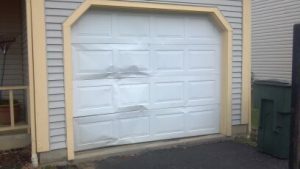 For example, let’s say just one part of your garage door gets damaged. Maybe a tree branch struck during a storm, somebody threw a ball at it too hard, or you backed into it with your car in the dark one night (or during broad daylight, it’s okay we won’t judge). Anyways, regardless of how the unfortunate event comes about a section of the door sustains damage, but not the entire door. Garage doors are a significant investment, and they are expensive to replace. It can be particularly disheartening, if your door is newer, expecting it to last many years. It seems like there should be a more practical solution to this problem. The short answer is yes, you can replace just one section of a garage door without having to replace the whole thing. However, the damage should be assessed by a professional to ensure that it is indeed contained in only one panel and that other panels haven’t sustained damage that might not be very visible yet but will cause problems over time. The age of the door. If your door is older, replacement parts may be difficult to find and therefore more expensive. Plus, if the door will need to be placed within a couple of years anyways, the money spent on replacing a panel will be essentially wasted. More than one section is damaged. Weigh your price options carefully here. Many times, if you are paying to replace more than one section, it will probably make more sense to go ahead and buy a completely new door instead. Over time, exposure to the sun and other weather elements will cause your door to fade, and/or the color to change. It may be too difficult to match the exact color of the new panel to the existing door so if that matters to you, be aware of that possibility. Can you live with a slightly different colored panel or will you also need to pay for repainting everything? If you determine that replacing a garage door panel section is the best in your case, contact a reputable company like American Garage Door. Simply provide us with the model, color, section size, and whether it is the top, middle or bottom, and we can help you get that panel replaced. It’s a pretty painless process! We hope that this tidbit on garage door maintenance – replacing panel sections has been helpful. Feel free to call us with questions or for assistance.